Since its inception in 1914, Vanity Fair magazine has been a beacon of literature, attracting the most influential writers of the last century. 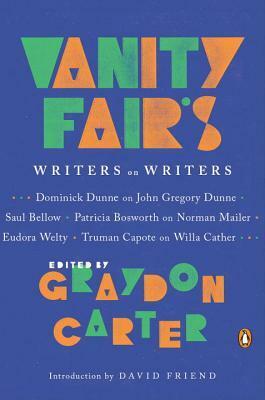 An ode to those impactful storytellers, VANITY FAIR’S WRITERS ON WRITERS edited by Graydon Carter; introduction by David Friend, is a collection of the magazine’s forty-one best pieces about accomplished writers by accomplished writers. What did Christopher Hitchens think of Dorothy Parker? Or what did Salman Rushdie think of Christopher Hitchens? How did meeting e.e. cummings change the young Susan Cheever? What does Martin Amis have to say about how Saul Bellow’s love life influenced his writing? Collected here for the first time are essays about novelists, poets, journalists, and publishers. From James Baldwin to Joan Didion to James Patterson, VANITY FAIR’S WRITERS ON WRITERS is an assembly of the very best of these essays, giving readers a look into the lives and psyche of some of the world’s most esteemed writers. Talk about the perfect book for book lovers and writers! A superb collection of bookish essays about some of the BEST writers, written by some of the BEST writers - how awesome does that sound? It sounds like bliss to me. Fortunately, it was. I am a huge fan of books about books. So, believe you me, I was thrilled to read a book about writers writing about writers. I just loved settling down with this delightful tome and dipping into essays about Toni Morrison, Ernest Hemingway, and Truman Capote. And to top it off, the essays were written by Jacqueline Woodson, Martin Amis, Dave Eggers, and Nadine Gordimer. Who wouldn't want to read their thoughts and opinions about their friends, colleagues, and inspirations? Especially, if the stories they share are personal or their critiques are less than polite - now that is a fun time. In fact, this book reminds me of a classmate of mine from grad school. He was always sharing biographical tidbits of the author's or critic's works we were discussing, as if he knew them personally. He was always fascinated by their personal lives and how it affected and influenced their writing. He would absolutely LOVE this book. I admit that it annoyed me at first, but eventually I grew to enjoy the bits and bobs he shared with us. It definitely made me look at certain writers differently and wonder about their work. And now, I love books about books and books about writers. Vanity Fair's Writers on Writers is most definitely a must-read for anyone interested in the 'literati' - you will LOVE this book! I would happily recommend it to fans of the magazine Vanity Fair (these essays were from the magazine) and fans of books about writers. I just know you'll enjoy it as much as I have. Thank you to the publisher for providing me with a copy of this book!